10 pcs per pack 15x14mm 7mm side to side Large Hole Beads Pirrate Skull in Antique Silver Lead free Pewter. 8 pcs per pack 12x8mm side to side Large Hole Beads Skull in color to choose Lead free Pewter. 5 pcs per pack 14x12x9mm top to the bottom drilled Regular Hole Beads Skull Antique Silver or Gold Lead free Pewter. 8 pcs per pack 12x8mm top to the bottom drilled Large Hole Beads Skull in color to choose Lead free Pewter. 3 pcs per pack 84x30mm Large Solid Skeleton Key with Pearl Antique Silver Lead free Pewter. 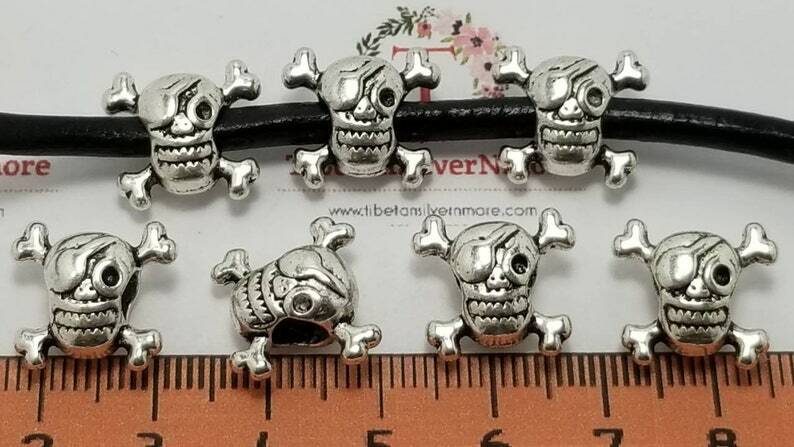 12 pcs per pack 11x8x7mm side to side Large Hole Beads Skull in color to choose Lead free Pewter. 12 pcs per pack 8x10mm Friends & Family Charm to choose from 6 different print in Antique Silver Lead free Pewter. 14 pcs a pack 27x15mm One side Shrimps Charm Antique Silver Lead Free Pewter. 12 pcs per pack 22x10mm Medium size Praying Girl Charms in Antique Silver lead free Pewter.